Schererville, IN. (October 3, 2018) BTN — Orville Cochran, a former leader of the Outlaws Motorcycle Club has pleaded guilty to one count in a four-count federal indictment — racketeering conspiracy. He and others are alleged to have conspired to assault and murder members of rival biker groups in Indiana in the 1990s. In 2001, a warrant was issued for Cochran’s arrest, out of Milwaukee, by the U.S. Marshals. According to the federal indictment, Cochran and others employed by or associated with the Outlaws Motorcycle Club, between January of 1988 through at least May of 2001 committed “murder, attempted murder, conspiracy to commit murder, arson, attempted arson, conspiracy to commit arson, extortion, attempted extortion and conspiracy to commit extortion and narcotics trafficking in Illinois, Indiana, Minnesota, New York and Wisconsin — with the defendants agreeing that a conspirator would commit at least two acts of racketeering. During this time period, the indictment says Cochran was a member or president of the Chicago Southside Chapter of the Outlaws Motorcycle Club — part of the “Midwestern White Region” of the international organization. The indictment says the Outlaws had a longstanding rivalry with the Hell’s Angels biker club and their affiliates, and until around 1993, the Outlaws controlled the Wisconsin, Illinois, Indiana territory — with the closest Hell’s Angels chapter located in Minneapolis. In late 1993 or early 1994, leaders of the Outlaws believed the Hell’s Angels might be trying to gain a presence in the Outlaw’s “White Region” territory by “patching over” one of their affiliates that was present in Chicago, Rockford, Calumet City, Ill. and South Bend, Ind. Outlaws members agreed “they would engage in a series of assaults” against the “Hell’s Henchmen” and other affiliates to discourage them from becoming Hell’s Angels chapters, and to prevent the Hell’s Angels from infiltrating their territory. 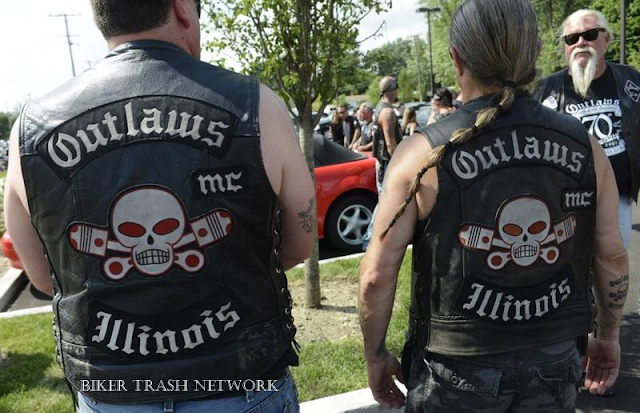 They also agreed they would support other Outlaws chapters dealing with similar rivalries — considering themselves to be “at war” with rival biker clubs. In June of 1994, Cochran and other Outlaws traveled to the Illiana Motor Speedway in Schererville, Ind. “to assault rival bikers” at an event known as “Summer Madness.” The then-Outlaws VP told investigators the “assaults” could include beating the rival bikers, running them over with a car or motorcycle or shooting them “to discourage Hell’s Angels affiliate club members from continuing to associate with the Hell’s Angels — and send a message to the Hell’s Angels that their presence would not be tolerated in Outlaws territory. The indictment notes Outlaws members from Milwaukee and Wisconsin planned to attend this event — with CCW permit holders “directed to arm themselves” and two vans, one armored from Milwaukee, containing firearms and other weapons, were brought to Indiana as part of the “Outlaws caravan” to the speedway. The night before the event, the indictment says Outlaws members learned their regional boss had been shot and seriously injured while riding on the Dan Ryan expressway in Chicago after leaving an event at the Gary clubhouse in Indiana. Outlaws members believed the Hell’s Henchmen were responsible — with the Hell’s Angels courting them. The Outlaws’ animosity for the Hell’s Angels grew after this incident. As it turned out, no rival bikers showed up, and the Outlaws packed up and left. The procession was followed, and the second armored van ended up stopped by police. A driver and five passengers from the Milwaukee Outlaws chapter were inside, along with numerous weapons and rounds of ammunition. In June of 1996, the indictment says Cochran and other Outlaws traveled to the US 41 International Dragway in Morocco, Ind., “to assault and kill members of rival biker groups.” This, after the Outlaws learned the Hell’s Angels had a big presence at this event in 1995, and they reserved several hundred tickets for 1996. Two old surplus-type police vehicles were used for security by the Outlaws at the event — with firearms concealed inside. Ultimately, rain resulted in the cancellation of the event — and most people left, but the Outlaws remained for three days. No rival bikers showed up. Cochran faces up to 20 years in prison, and $250,000 in fines, along with a $100 special assessment and three years of supervised release.